Recreating the environmental conditions experienced on the icy moons of Jupiter and Saturn sounds like an impossible task, but that’s what Helen Maynard-Casely is doing at the Australian Synchrotron. A journey to the centre of the planets is also in her sights. Unlike our own planet, which is made of silicate rocks, the moons in orbit around Jupiter and its sister planets Saturn, Uranus and Neptune are made of icy materials: mixtures of water, salts, methane and ammonia. Despite their relatively simple makeup, these planetary bodies exhibit some extraordinarily complex geological features. From the Chaos Terrain on Europa (a moon of Jupiter) to the Tiger Stripes of Enceladus (one of Saturn’s companions) it seems that these simple molecules can produce just as diverse features as their terrestrial silicate counterparts. However, we are still some way from discovering how these features form, mainly because we don’t yet understand all the physical parameters of the materials that make up these moons. Take Europa for example. 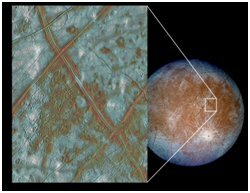 There’s evidence to support the fact that crystalline sulphuric acid hydrates make up some of Europa’s surface of this icy moon, but some fundamental questions remain unanswered. How do these materials respond to heat, and what crystal structures do they favour? 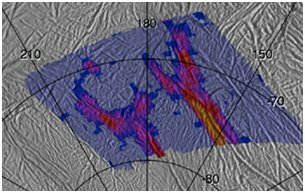 With the great range of environments available at the AS powder diffraction beamline, Helen and her colleagues are recreating these planetary conditions and using the beamline’s high-resolution diffraction capacity to start probing these materials from the inside. In the first of what is hoped will be a new program of experiments at the powder diffraction (PD) beamline, the researchers have re-evaluated the structure of the most water-rich sulphuric acid hydrate (an octahydrate) and measured its thermal expansion. Their results have shown that sulphuric acid octahydrate’s response to heat is highly influenced by how the water molecules are coupled together throughout the structure. The relatively strong bonding of the water molecules restricts the structure from expanding in two directions, so that practically all the thermal expansion happens in only one crystallographic direction. Sulphuric acid octahydrate also has high overall thermal expansion, exceeding that of water ice below 140 K (below minus 133°C). Since typical daily temperatures on Europa max out at 125 K or -148°C (and you thought Melbourne had had a bad winter! ), models that only account for water ice would underestimate the material expansions that could occur in this temperature range. 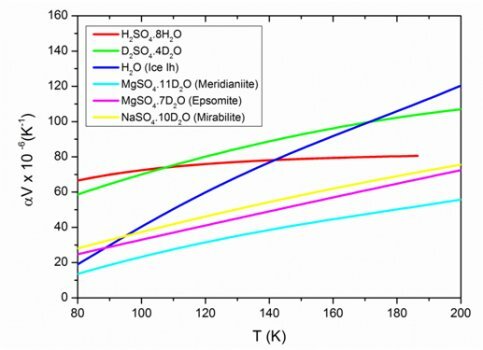 Figure (left): comparing the thermal expansion of sulphuric acid octahydrate (H2SO4.8H2O – red line) to that of other ‘icy’ planet materials over a range of temperatures shows that this exceeds the expansion of water ice (blue line) at temperatures below 140 K.
The next step in Helen’s research program is to utilise the new high-pressure capabilities of the PD beamline to take a journey to the centre of the planets! The maximum pressure at the centre of the moons she’s studying is around five gigapascals (GPa), and the PD beamline can now handle up to 30 GPa. For comparison, standard atmospheric pressure on Earth is a little over 100 kilopascals (one ten-thousandth of a gigapascal) and the pressure at the centre of the Earth is around 350 GPa.